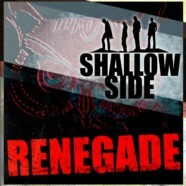 Shallow Side have released their second single and video for the song “Renegade” as well as their previous single “Rebel” will appear on their debut full length album ONE on Thermal Entertainment, LLC due in 2017. The band received a great endorsement when Tommy Shaw was sent the video and said “Damn that’s smokin’, I approve”. They have also released two EPs HOME TODAY (2012) and STAND UP (2014). The first single and video “Rebel” has accumulated over 600k views on YouTube and has been listened on Spotify 450k times. It can be seen here.